Do you play Defense of the Ancients 2? I mean DOTA 2 on Steam. You and your crew might have mad skills on the game but keep losing out. It might just be that you are playing in the wrong place or playing at the wrong time. The great thing about Steam is that it’s all over the world. Check out Steam Stats and you’re going to find that there’s regularly fifteen million people online at two in the morning on a Wednesday. That might seem crazy, but you’ve got to remember that DOTA 2 is global. They’re playing it in Japan, they crush it in Dubai, there’s people scriming their asses off in Turkey, France, Timbuktu, and Miami. So, when you’re asleep or out, there’s still millions defending an Ancient at every point of the compass. So, build up your stats in a different arena. You don’t have to be trapped by where you live. Look around the world and get matchmaking to pair you against opponents easier than the ones you’re currently facing. If you ace your region get out of there and kick up a fight in a tougher place. The easiest way to switch is to get a VPN. ExpressVPN is just about the best VPN on the planet. What you do is check into one of their sites and then connect to Steam for DOTA 2. ExpressVPN has got two servers in Singapore and they’re both big, so you’re not going to get shut out because they’re overloaded. They’ve got a server in South Africa if you want an easy fight and if you want to get into Europe, then they’ve got two servers in Sweden, one in Vienna and one in Luxembourg. You can also game in Brazil through either of ExpressVPN’s servers there. There are actually five ExpressVPN servers in Australia. The techies at ExpressVPN are top notch. They’re online all the time and you can get to them on demand through a live chat box on the site. So, if you’re up against some problem, they’ll sort it out in real-time, without you having to wait around for an email to come back. VPNArea has got staff that play DOTA 2 and other online games, so they really get you. Their help desk is online but not 24 hours, more like 16. This is a really good VPN for gaming and also for downloading with torrents and video streaming. Check out the server locations of this VPN. In total, VPNArea’s got servers in 70 countries. Seven servers in Brazil is impressive, but get this: 14 servers in Australia. They’ve got three servers in Singapore if you’re looking for a match-up in Asia. Sneak into one of VPNArea’s four servers in South Africa for a rumble in the jungle. Up in Europe, you’ve got access to three servers in Sweden, a server in Luxembourg and three in Austria. There are lots of other server locations, but these are your key DOTA 2 choices. IPVanish is based in the USA and they are the best for speed. You’re going to see lots of VPN companies saying they’re the fastest in the world, but the real story is that IPVanish has the top speeds on the planet. That speed can get you a win while your opponents are lagged by bad ping. If you want to get into North American tournaments, then this VPN is probably your best bet. IPVanish has 42 servers in Ashburn, VA, just down the road from the Steam server in Sterling. That’s off the chart. It also has 41 servers in Seattle. That’s right, 41! And just a couple of miles from Steam’s West Coast center. IPVanish isn’t just about the USA. Check this out: there are 14 servers in the heart of Sao Paolo plus eight more in Rio, so you can get into a Brazil match without lag. Steam’s Australasian servers are in Sydney, Australia and IPVanish has 59 servers there. They have 18 servers in Singapore if you want to get into it with the people of Asia. OK, you want to get into Europe to fight against the best in DOTA 2. Get this: IPVanish has got 14 servers in Stockholm, Sweden, six servers in Vienna, Austria, plus another in nearby Graz, two servers in Luxembourg and a lot more close to the Grand Duchy: one in Belgium and 94 in the Netherlands. NordVPN gives you servers in 59 countries and they are well dispersed for DOTA 2 players. This VPN has 995 servers all across the USA and they’ve got six in Brazil, so that’s DOTA 2 players in the Americas covered. However, you really need to be in Europe to get the best matches in DOTA 2. Steam’s Northern Europe servers are in Stockholm, Sweden, and NordVPN has 103 Swedish servers to get you fast access there. There are 22 NordVPN servers in Austria, which get you close to the Steam East Europe HQ in Vienna. Steam’s servers for Western Europe are in Luxembourg. NordVPN has 26 servers in that tiny country plus another 40 in neighboring Belgium and 191 in the Netherlands. If you want an easy fight, go for the ten NordVPN South Africa servers to get you a speedy connection to the two Steam servers in Africa. There are 121 servers in Australia and the most crowded market in the steam world in Asia is well server by NordVPN’s eight servers in Singapore. VyprVPN is staffed by avid gamers, so you will be able to communicate with no hassle when you write about your DOTA 2 problems. These people play DOTA 2 as well, so they can give you tips. VyprVPN is based in Europe, so the company is strongest in the DOTA 2 heartland. The company has a major presence in Sweden, Luxembourg and Austria, so it matches the DOTA 2 Steam server network well. The server network has a presence in Seattle, Virginia, Singapore, Sydney, and Sao Paulo as well. However, VyprVPN doesn’t have any servers in South Africa, which is why it turns up at the bottom of our list. There are several things to consider when getting a VPN for DOTA 2. See below for considerations. 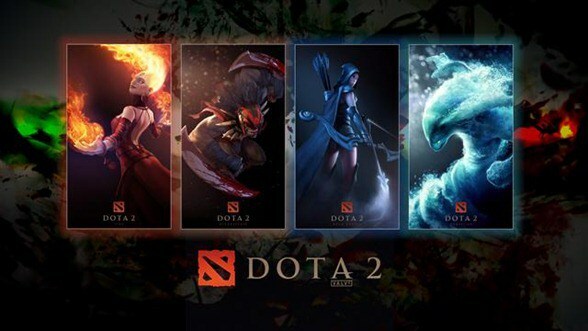 DOTA 2 is run by Steam, which is owned by Valve Corporation in the USA, so you might think that it’s all set up to please the people who live where the company is based — they’re in Washington State on the West Coast. Not so. In fact, whenever they take the system down, they do it in the evening in America. Why? That’s mad because you would think they would shut it off at like 2 in the morning or something. But the big market for DOTA 2 is in Europe, so they shut it down in the dead hours there. All the big players on Steam are in Europe and so Steam bends over backwards to make life better for them. Every other bit of the planet has to put up with a worse service. So, during downtime shift yourself over to Europe and stop suffering. It costs a ton of money to fly off to Europe and you’re not going to go there and back every night of the year. But there’s a cheat so you don’t have to actually be in Europe in order to play like you are there. VPN is a cool network cheat that makes it look like you’re somewhere else. Where do you go? Wherever you want to be. When you start the VPN up on your computer you first choose a location. When the connection goes through you will look like you are in the country of that VPN location that you chose. So, look at that list of where all the DOTA 2 servers are. How many people do you think play DOTA 2 in Africa? There’re two servers in South Africa. There aren’t that many people in South Africa. I’m going to go over this again. There are as many DOTA 2 servers in South Africa as there are in the whole of North America. You want an easy fight? That’s where you need to go. Now, Singapore is tiny and they’ve got two servers, too. However, the logic for searching for an easy fight no longer applies in this case. Everyone in Asia is piling into these two servers. That’s everyone in China, everyone in India, everyone in South Korea and everyone in Japan. These are not servers to access if you’re just finding your feet. This is no training camp. The Singapore servers offer really challenging fights, but they are overrun. The best players are in Europe, so if you’re looking to crush it, that’s where you’ve got to go. Getting a VPN for DOTA 2 is really neat. You can get fights all over the world without leaving home. You’re up and running to defend your Ancient, you’ve got your guys online, you’ve got your strategy sorted, but then you’re in a queue. Goddamn! Switch over to Cape Town and get in quicker, or if you’re really at the top of your game get your VPN onto Stockholm and prepare to battle the Russian teams! It’s better to queue for the fight of your life than spend all of that time waiting just so you can be up against Marvin next door, AGAIN!! VPNs are really amazing. When you get one, there’s lots of stuff you can do, not just play DOTA 2. Sign your team up for one of our recommended VPNs and get fights all over the world. You can also get into overseas video streaming services with a VPN. If you want to get into downloading with BitTorrent, you will probably find that your internet service provider blocks you from getting into The Pirate Bay. Your VPN can help you with that, too. Try out a VPN and just keep enjoying yourself no matter what the government says you can and can’t do.